When Dallas debuted in 1978, the world wasn’t quite ready for the nighttime soap opera. The first season consisted of a five-hour mini-series, and the second season expanded into 24 episodes; both seasons had low ratings. But during the final episode of season three, in March of 1980, something miraculous occurred: J.R. Ewing (Larry Hagman) got shot, and turned Dallas into a worldwide phenomenon. Dallas was a precursor to other popular 1980s night soaps, such as Knots Landing (a Dallas spinoff, also created by David Jacobs), Dynasty, and Falcon Crest, all of which went off air by the early 1990s. 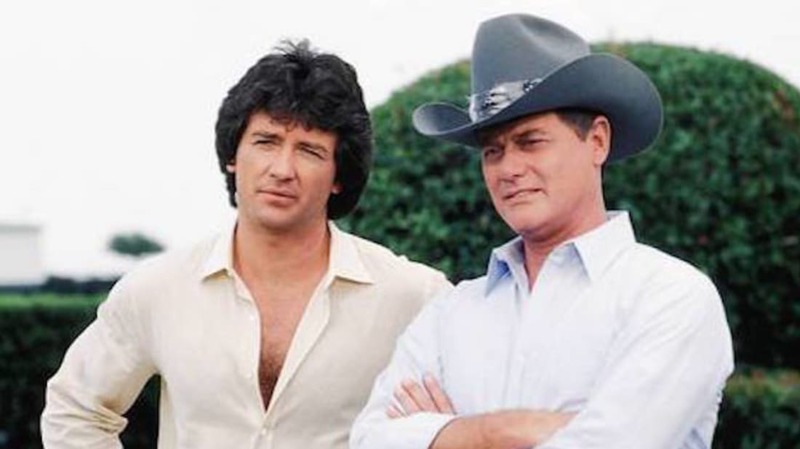 After 357 episodes and 14 seasons, Dallas signed off on May 3, 1991, but lived on in three TV movies. Then, in 2012, TNT rebooted Dallas for three seasons, with Hagman, Linda Gray (Sue Ellen Ewing), and Patrick Duffy (Bobby Ewing) reprising their roles. In honor of the series finale's 25th anniversary, here are 14 big-in-Texas facts about J.R. and his conflicted family members. 1. CREATOR DAVID JACOBS DIDN’T KNOW THE SHOW WOULD BE SET IN DALLAS. How Dallas came to be set in the city was by chance: Creator David Jacobs had a development deal with Lorimar Television and wrote a story about Ewing Oil in 1977. Lorimar executive Michael Filerman read the story and said, “‘Yeah, it was fine. But I changed the name,’” Jacobs told the Texas Observer. “And I said, ‘Well, what did you call it?’ He said, ‘Dallas! It sounded better than Houston.’” At the time, Dallas was known more for its bankers; Houston was known for oil. 2. DALLAS WAS THE LESS CLASSY VERSION OF DYNASTY. “Dallas was fairly modestly mounted: Southfork was big but no mansion, and now and then the characters wore jeans to breakfast,” Jacobs wrote in The New York Times. “Dynasty was perhaps the most extravagantly produced series in the history of episodic television: the sets were more opulent, the wardrobe more expensive, the lifestyles more ostentatious—the characters dressed for breakfast and wore jewelry with lingerie. During almost any other period, Dynasty would have been regarded as more vulgar than Dallas. In the mid-80s, however, Dynasty was widely viewed as the classier of the two shows. As it happened, both Dallas and Dynasty faded as the Reagan Presidency faded. Indeed, Dynasty could not survive the changing of the guard. It was gone by the end of George Bush's first hundred days.” Now let’s imagine Joan Collins in a ten-gallon hat. 3. LARRY HAGMAN AND PATRICK DUFFY DRANK A LOT ON SET. 4. SUE ELLEN WAS ORIGINALLY CONCEIVED AS A MINOR ROLE. In the pilot, Linda Gray—who played J.R.’s wife Sue Ellen for several seasons—isn’t even given a name in her limited screen time. Casting wanted Newhart actress Mary Frann for the role, but Gray impressed the network enough to change her character into a main cast member. 5. NEITHER HAGMAN NOR JACOBS VIEWED J.R. AS A “BAD” GUY. 6. HAGMAN MODELED J.R. AFTER A REAL-LIFE OIL BARON. 7. DALLAS MAY OR MAY NOT HAVE LED TO THE FALL OF COMMUNISM. In 1989, Ceaușescu and his wife were assassinated, and Romanians began to experience more freedom without a tyrannical rule. According to The Washington Post, after the dictator’s exit, the show’s previously censored scenes were edited back in and aired. Hagman had a friendly relationship with communist Bucharest; in exchange for them using his image in ads for Russian oil firm Lukoil, Hagman accepted quite a bit of cash. Hagman didn’t want anybody to know about his compensation until his death, which is when the news finally leaked. 8. THERE WAS A ROMANIAN VERSION OF SOUTHFORK. Romania loved Dallas so much that a tycoon named Ilie Alexandru built a hotel complex called Parcul Vacante Hermes, or “Southforkscu,” in Slobozia, Romania. The Texas Observer reported that Alexandru wanted to be like J.R. Ewing so he built a hotel and called it “Dallas.” He also erected horse stables, polo fields, and a replica of the Eiffel Tower. None of that stuff exists today, and Alexandru went to prison for financial crimes. At least the American Southfork still thrives. Southfork, where the Ewings lived on the show and where the show's exteriors were filmed, is located in Parker, Texas. In 1985 the ranch-mansion finally opened to the public and is now a conference and event center (yes, you can get married at Southfork). You can also take tours of the mansion and grounds, and see the gun that shot J.R.
9. WHETHER OR NOT J.R. LIVED DEPENDED ON HAGMAN'S CONTRACT. Cliffhangers were becoming a thing on TV, and Dallas wanted to capitalize on that. The miniseries season ended with Sue Ellen getting into a car crash while pregnant, so the producers wanted to continue the tradition with “Who Shot J.R.?” “We just thought that since the show was really starting to climb and doing much better in the ratings we’d give the audience something to think about over the summer, and hopefully they’d be interested enough to really tune in in numbers for the first show next year. That’s what happened,” Dallas producer Leonard Katzman told Texas Monthly. Whether or not Hagman returned following the shooting, though, had to do with him wanting to be paid more money, which is why he went along with the “Who Shot J.R?” premise. “The shooting of J.R. was a double-edged sword; it gave my producers and the CBS bosses a perfect way to get rid of me in case my demands got out of hand,” Hagman told TV Guide in 1980. “Meantime, the pressures began to build. Certain rumors were allowed to circulate, such as an insidious scheme, worthy of J.R. himself, to have the ambulance burn on the way to the hospital, necessitating plastic surgery on J.R., who would emerge from the operation looking just like another actor.” He had a feeling the producers wouldn’t let J.R. die and that they’d acquiesce to his monetary demands. J.R. was shot in “A House Divided,” which aired in March of 1980, but fans would have to wait until November to find out who attempted to kill him. Those eight months caused such a frenzy that bookies took bets on who did the deed, and even Queen Elizabeth asked Hagman who shot him. “We were presented to the Queen Mother. And she says, ‘I don't suppose you could tell me who shot J.R?’ I said, ‘No ma'am, not even you.’” The show even filmed a gag reel of the cast and crew taking turns shooting Hagman, as a red herring. When “Who Done It” aired as the fourth episode of the fourth season, on November 21, 1980, the world finally discovered that it was Sue Ellen’s sister, Kristin (Mary Crosby), who did the deed. Up to that point, Crosby was best known for being Bing Crosby’s daughter, but “Being the one who shot J.R. made me a trivia question, and I’m really big in really small countries,” Crosby told CBS. After all that, Hagman prevailed and got his raise (plus a stake in the series). 11. VICTORIA PRINCIPAL REFUSED TO RETURN TO DALLAS, BECAUSE OF SHAKESPEARE. Victoria Principal played Pamela Ewing, who supposedly died in a car crash in 1987 as a means for the actress to exit the show, but returned the following season after having gone under the knife, and was then played by Margaret Michaels. Unlike her onscreen hubby, Principal declined to ever return to the show. 13. A DALLAS VIDEO GAME EXISTS. In 1984, Datasoft invented a game called The Dallas Quest for the Commodore 64 computer. The premise of the game is that Sue Ellen summons the player to Southfork and tells them she wants them to find a map of an oil field and return it to her. If the player is able to thwart J.R. and return the map, they’ll receive $2 million. The game didn’t have all that much to do with Dallas; you spent most of the game fighting off angry cattle, monkeys, and of course, the Ewings. 14. THE SHOWRUNNER OF THE DALLAS REBOOT DIDN’T WANT IT TO BE CAMPY.